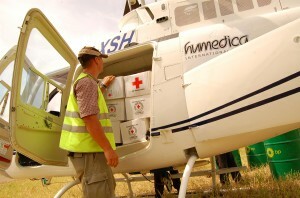 Many light cargoes can be delivered by helicopter. They can be carried internally or in nets under slung below the helicopter. There are many international and national regulations for light cargo by air. There are also dangerous cargoes that have special rules. We would expect you to have established whether the cargo can be flown. If in doubt have a look at this page. This is our normal way of carrying cargo by helicopter. We have done it plenty of times, so you can charter us with confidence but each case is slightly different. So please contact us and we can see what you need. Then we will know how to help. Under slung light cargo is a special case. The helicopter needs special equipment and it is regularly tested. The good thing is many helicopters can carry more under-slung. This is because the slinging point is right under the centre of gravity. However, some loads have a tendency to fly on their own. Please contact us so we can understand what you want, we need to do that . The United Nations have banned child trafficking, drug trafficking, smuggling. We do not fly these cargoes. Please do not even consider chartering us or our helicopter for any such work.